Since time immemorial, people have burned incense for aesthetic, medicinal, spiritual, and practical purposes in nearly every culture on Earth. Since ancient times, incense has been one of the most prized commodities found burning in temples, courts, palaces, markets, on the streets, and in the homes of commoners and nobility alike. To put it simply, incense is a tool for helping people find greater balance, peace, and joy in life. Whether used to enhance a spiritual ritual, prayer, or meditation, to heal and bring balance to the mind, emotions, body, and spirit, or to celebrate the sense of smell with intoxicating aromas and heavenly scents, incense is the most universal modality utilizing aromatic plants. In the old days, there were very high standards for quality incense materials. Merchants and farmers prided themselves in offering aromatic botanicals of the highest purity and superiority. A majority of the incense crafters of old were responsible for creating mixtures of exotic and sacred ingredients for many spiritual and ceremonial purposes, therefore any lower grade ingredient simply wasn’t acceptable. 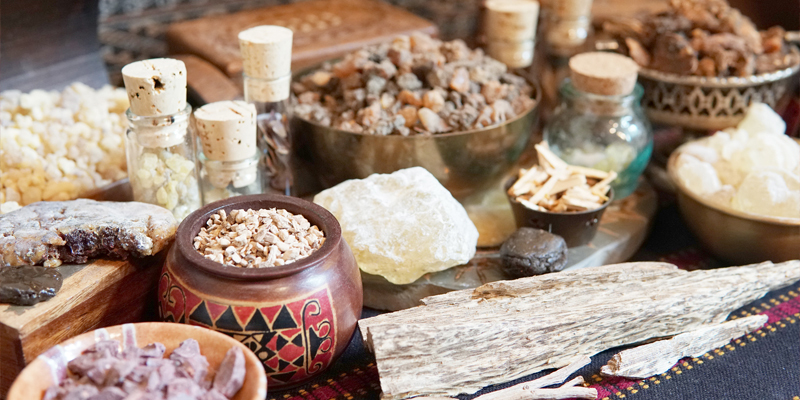 At the same time, many esteemed medical practices around the world also utilized incense as a therapeutic tool. Therefore, seeking out the purest and highest grade materials for medicinal incense was a priority. Today’s mainstream incense market has changed drastically from what was once a rich, fragrant array of exotic tree resins, loose herbal mixtures, raw, high-end aromatic woods, and artisan blends of quality organic ingredients. Today it can prove a challenge to find an incense made strictly with natural and organic ingredients, let alone ethically sourced materials. Most imported commercial incenses from India, China, and other Asian countries are a mixture of questionable materials, synthetic chemical fragrances, and over-harvested herbs, woods, and resins. In the shadow of these large market-dominating incense producers who are widely sold throughout the US, there are still many smaller companies and artisan incense crafters around the world doing their part to keep the rich incense crafting traditions alive, while ethically sourcing natural and organic materials and supporting sustainable harvesting of aromatic plants. It’s up to the consumer to search out and support the artisan companies and vote with their dollar to help keep the rich natural traditions of incense crafting alive and thriving. In addition to supporting artisans, I also believe that incense enthusiasts should learn the ways of incense crafting themselves to deepen their understanding of this ancient art, to incorporate their local plants into their own incense, and to share their aromatic gifts with the world. The more artisans out there, the better our chances are of turning this ancient ship around back towards purity and tradition. The many varieties of incense are nearly as diverse as the cultures who make and utilize them. They range from single dried herbs burned on hot charcoal, to the most complex herbal mixtures of Tibet (sometimes traditionally comprised of over 100 ingredients). Incense takes many forms, including smudge sticks, raw tree resins, hand-formed pellets, cones, sticks, coils, single herbs, loose incense, and many more. Stick incense is perhaps the most common forms of incense today, of which there are two major types. Agarbatti sticks, as they’re referred to in India, contain a bamboo skewer at their center that makes them a bit easier to form and keeps them from breaking. The only downside to agarbatti is that the burning of the bamboo skewer slightly affects the overall aroma of the incense, giving off a very subtle burning wood scent. Agarbatti is most common in Indian and Chinese incense crafting. Dhoop incense sticks are made with solid incense ingredients and don’t contain a bamboo center. Japanese and Tibetan incense are most commonly found in the dhoop style. Both types are traditionally made from a mixture of aromatic herbs, resins, and water; usually containing some type of botanical-derived binder to hold the shape. Sadly, in today’s mainstream market, a majority of agarbatti sticks, and even some dhoop varieties, are made using harmful chemical fragrances and synthetic materials; especially the mass imported stuff. Many agarbatti sticks don’t even contain actual natural aromas. To make matters worse for the incense lover, the larger companies making these incenses aren’t required to list the ingredients they use, making it nearly impossible to know whether an incense is derived from Mother Nature or a chemist. Researching your incense before you buy it and sourcing from the smaller artisan companies is the best way to ensure the purity of your incense. Incense cones were first presented by the Japanese at the World’s Fair in Chicago in the late 1800’s. Today, the use of incense cones is widespread and continues to be a popular choice for incense enthusiasts. It’s also one of the easiest forms to make for beginning incense crafters. Cones tend to provide a more noticeable or intense fragrance as they burn faster than sticks, releasing more natural aromatic constituents into the atmosphere in a shorter timespan; whereas the sticks give off a more subtle aroma for a longer period of time. Cones are traditionally a mixture of aromatic woods, resins, and other aromatic botanicals. Cones also usually call for some type of natural binder or plant gum to help them hold their form. Unfortunately, the same story goes with incense cones as with the commercial production of stick incense. 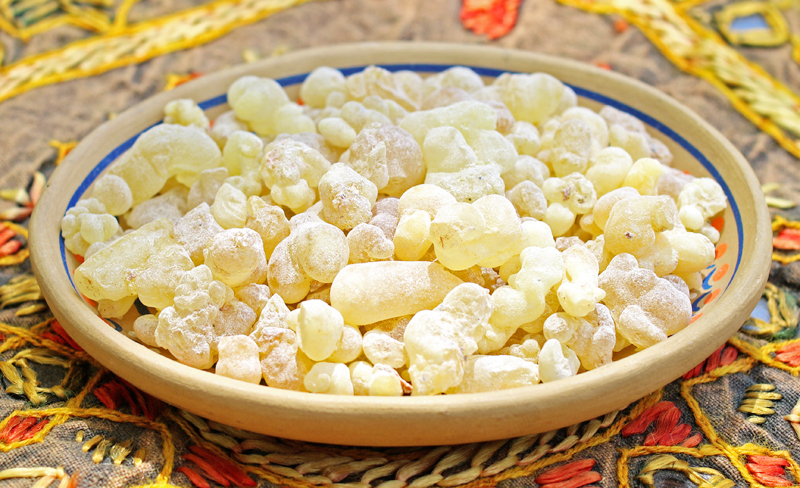 A majority of mass produced and imported incense cones are made using chemical fragrances and synthetic materials, mimicking natural fragrances. The reasoning behind this is simple, it’s cheap for the manufacturer and allows for much higher profits. Again, a little research can help you find natural artisan producers of incense cones, our company Higher Mind Incense being one of them. Throughout the world, the most simple means of burning aromatic plants is by placing a single dried herb or incense resin onto hot charcoal. This is the most ancient form of incense, before the creation of sticks, cones, or other complex formulation processes. This basic method is still very common and allows for someone to experience the many levels of aroma of a single aromatic plant in a more intimate way. Having a more meaningful, solitary experience with a plant can also bring about many therapeutic benefits. The ancient Japanese incense ceremony, the Koh-do, calls for the burning of single herbs in this way. This ritualistic practice can reveal insights into the many virtues and properties of a plant, while developing the fragrant palette of the incense connoisseur. Loose incense is another ancient traditional form of incense that was widespread throughout nearly every culture prior to the convenient invention of the stick and cone. As with single herbs and resins, a hot charcoal is needed to burn loose incense. In this way, the person burning the incense is required to be more present in a sort of meditation, while sprinkling a fragrant herbal blend onto smoldering coals as the smoke slowly dances upward. Loose incense is one of the simplest forms to make for people just starting out crafting incense. 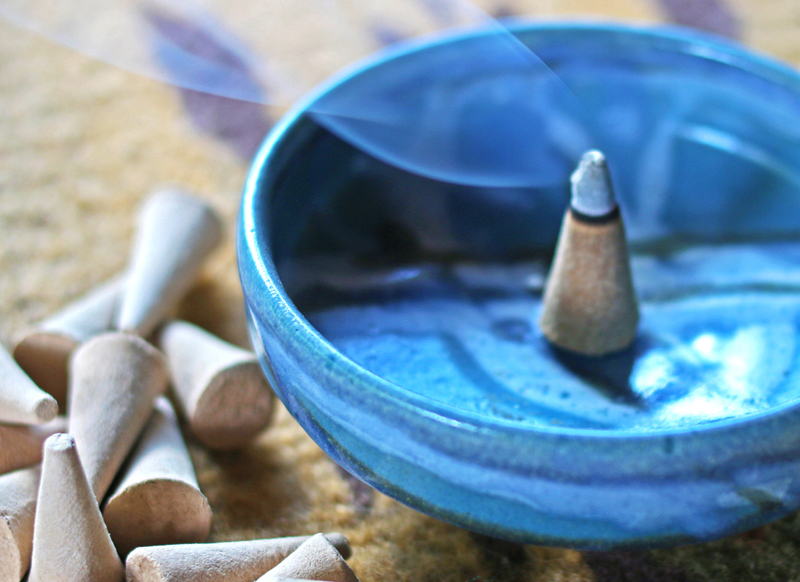 Burning loose incense can prove to be more of a ritual than using other varieties, and many people welcome this method into such practices as yoga, meditation, sacred rituals, ceremonies, artistic endeavors, etc. Loose incense is often a balanced combination of aromatic herbal ingredients, tropical hardwoods, and sticky incense resins. 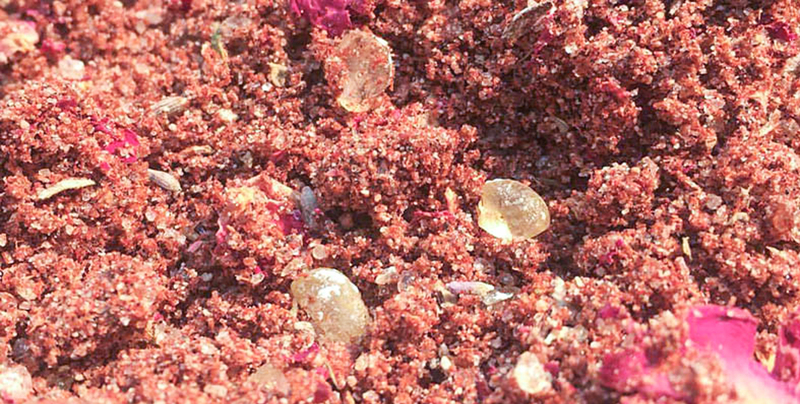 In addition to their sweet, uplifting aromas, the resins also act as adhering agents, helping to create a consistency like that of granola, creating small chunks throughout a mixture. In this way, the aromas emanating from each pinch of loose incense put onto a coal differs slightly, allowing one to fully appreciate and perceive each scented material in varying combinations. If you enjoy the use of incense, or are interested in learning traditional incense crafting methods, it’s important to be aware of the legitimacy and origin of the incense you burn and ingredients you buy to make it, as many corporate incense companies and suppliers have strayed away from traditional crafting, integrity, and the use of natural materials. Incense is used in many different forms to connect to the divine, calm the mind, sharpen the senses, and aid meditation. It’s also used to balance the emotions, treat certain ailments, heal imbalances, open the emotional heart, and uplift the spirit, to name a few. It’s one of the oldest ways to enter a deep connection with the plants you burn, allowing you to inhale a plant’s medicine and commune with it on a ritualistic level. No matter what forms they take, the aromatic plants of the world have a rich, sacred history and deep relationship to humanity that continues to be of great benefit to millions. Ready to take your work with aromatics and plants to the next level? 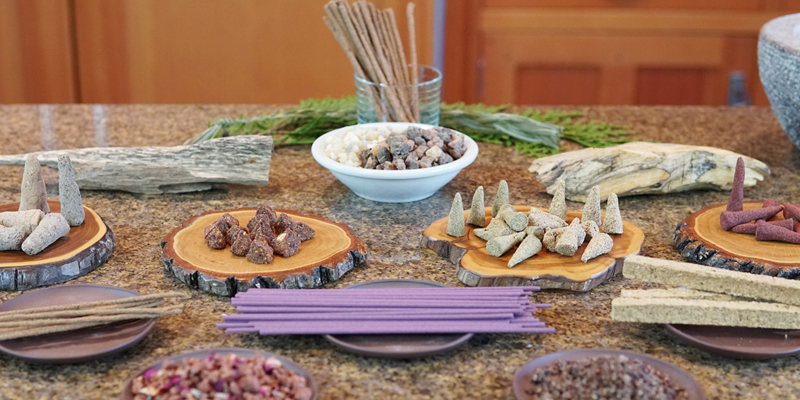 I invite you to join me for the Traditional Incense Crafting Course, where you’ll learn how to make many forms of incense for fragrant enjoyment, therapeutics, and ritual. Click here to learn more. © 2018 Evan Sylliaasen, The Northwest School of Aromatic Medicine. All Rights Reserved.